Few new readers have accessed online news in the past six months, according to Nielsen’s Online Ratings, as the category plateaus following a period of growth. In March, 12.1 million Australians accessed media brands online but the overall category has seen “has seen little growth over the last six months”, according to Nielsen’s report. Year-on-year growth has seen the category increase from 10.8 million readers in March 2011 to 12.1 million over the current period, with the audience skewing towards males over 35 year of age and households earning $75,000 or more per annum. NineMSN/MSN remains the highest ranked media brand in terms of reach – and the third highest ranking website brand overall behind only Facebook and Google – commanding a unique audience of 10.7 million. 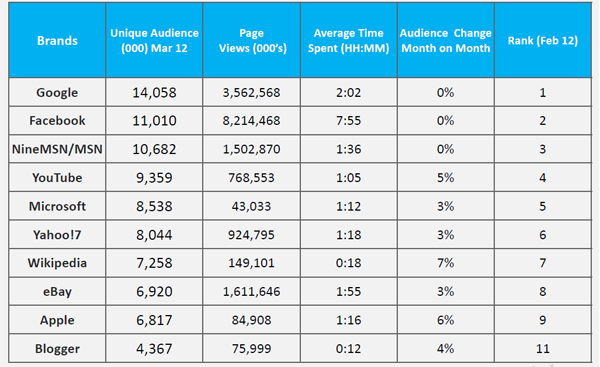 Yahoo!7 was the only other media brand to rank in the top 10 brands, with a total of 8.0 million visitors in March. However, in terms of engagement, the Sydney Morning Herald and The Age dominated the statistics. 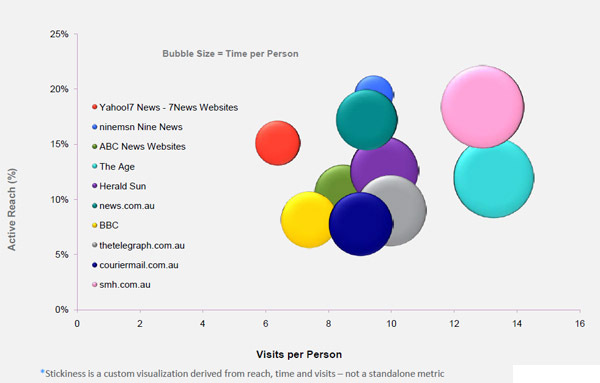 Nielsen’s measure of stickiness, which incorporates site reach and number of visits and time on site per reader, places the two Fairfax mastheads ahead of other media brands. In the overall rankings, the top nine ranked brands retained their ranking, with the only change coming from Google’s Blogger sites which moved from 11th position into tenth. Facebook continues to dominate time spent on site with 7 minutes and 55 seconds per session.